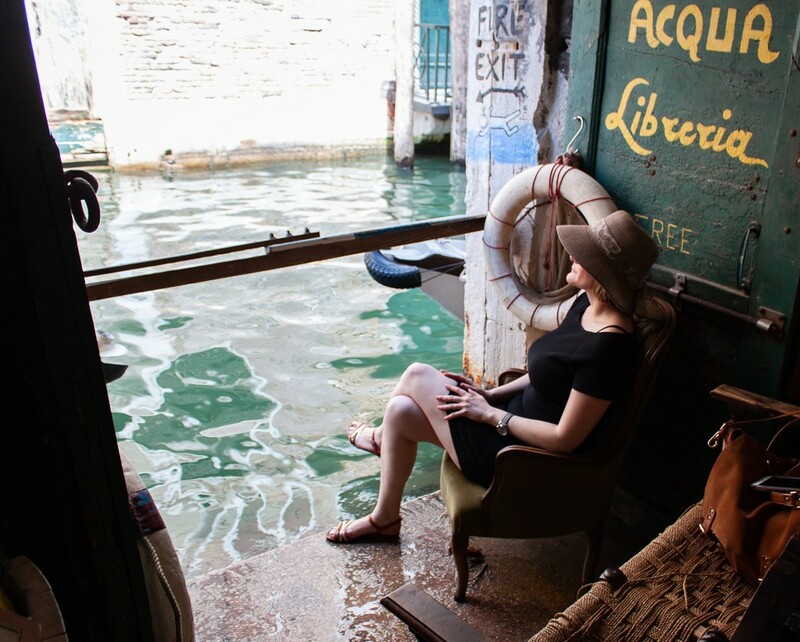 Just last summer, I ticked off one of my travel bucket list dreams to visit Venice, a city that I’d only ever read about in travel magazines. 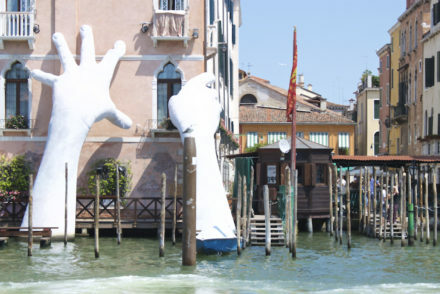 While I did lots of the typical touristy things like ride in a gondola, drink a Bellini, and walk through the endless maze of narrow streets alongside the canals, I made it a point to check out some of the more weird and offbeat things in Venice, like the hands sculpture in the Grand Canal. 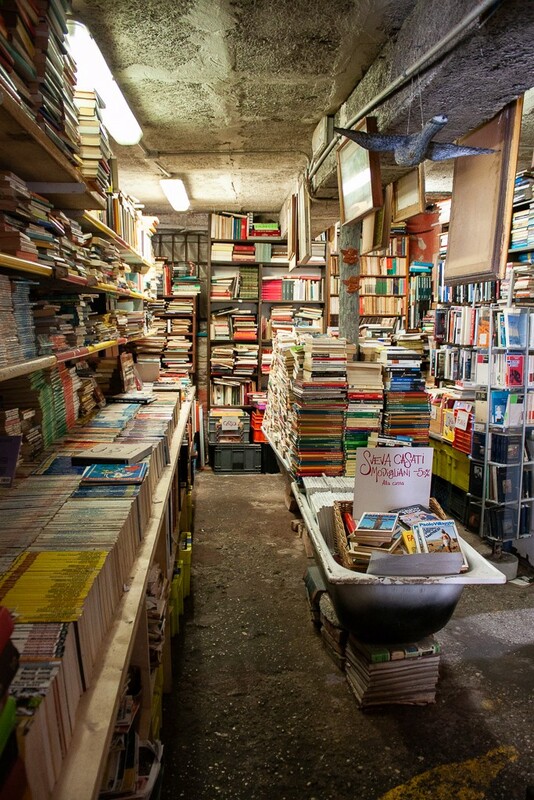 Of course, it also meant a visit to the city’s most famous bookstore, Libreria Acqua Alta. I always love a good bookstore, not only for the purpose of buying books but to simply soak up the ambience. 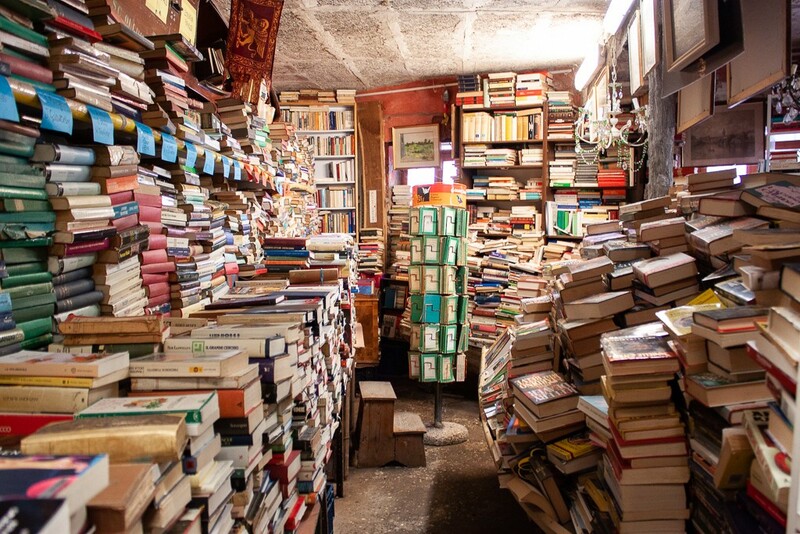 I could easily spend hours wandering through a bookstore, paging through books, delighting in the selection, pondering which one to purchase, and then running home with something to read that very night. My suitcases often get heavier on my return flights home because I cram them fill of so many books. 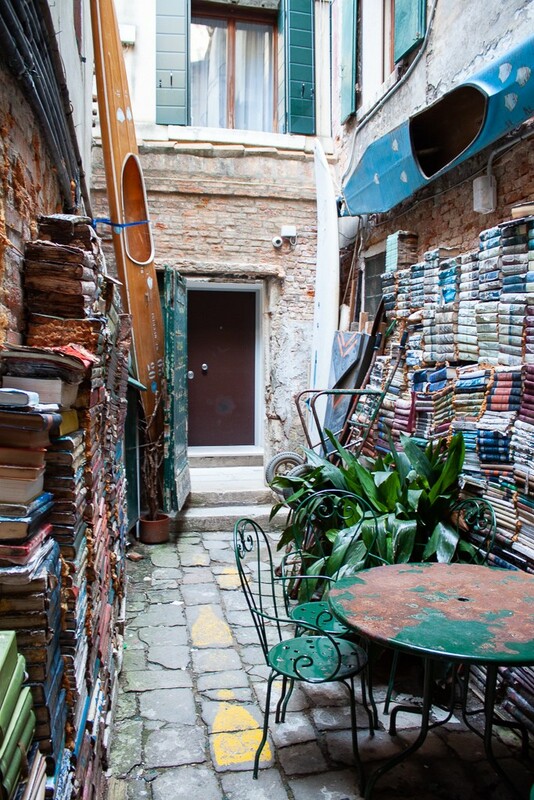 Libreria Acqua Alta, close to St. Mark’s Square, opened in 2004. 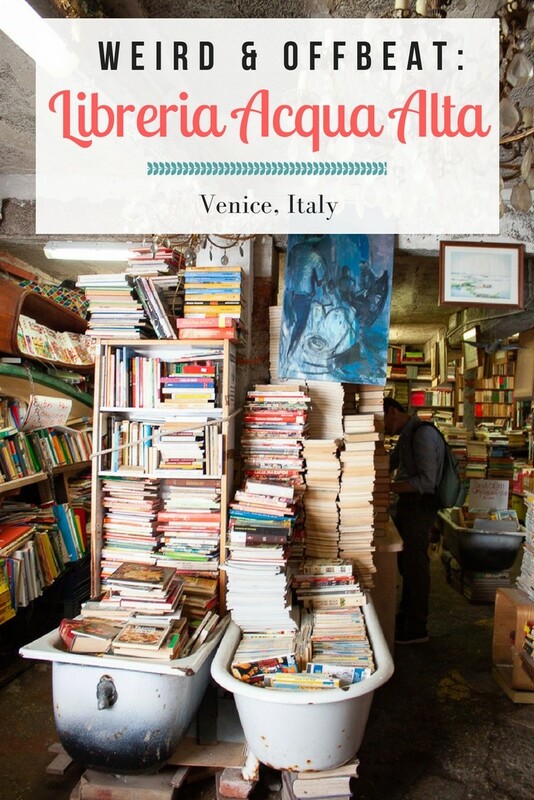 The name translates to “bookstore of high water” due to the store being plagued by Venice’s rising waters, which regularly flood the floors of the shop each winter. 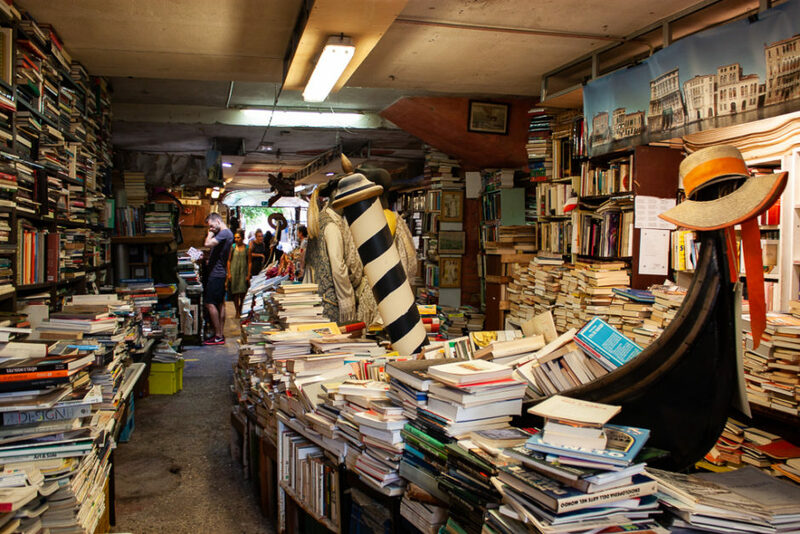 To combat the issue, the bookstore’s owner, Luigi Frizzo, piled all of the books into waterproof bins, bathtubs, canoes, and even gondolas in order to protect the literature. 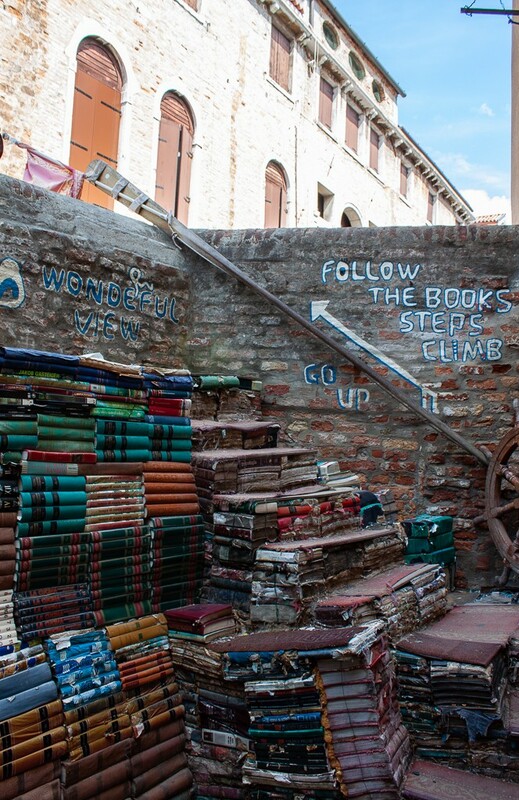 Recommended reading: Review what others have written about this precious quirky bookstore – see this article from Venezia.net or this one from My Corner of Italy. When I first arrived, I didn’t really think the bookstore was all that impressive from the outside. 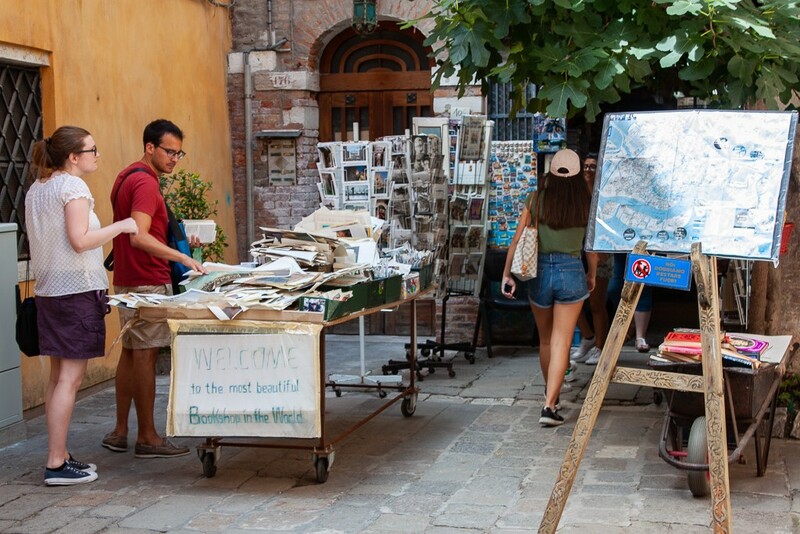 It looked like most other storefronts sprinkled throughout Venice. I wondered if I’d come to the right place. I smiled doubtfully when I saw the handwritten sign boldly claiming Libreria Acqua Alta to be the “the most beautiful bookstore in the world.” I thought that it had nothing on the striking opulence of Cărturești Carusel in Bucharest. 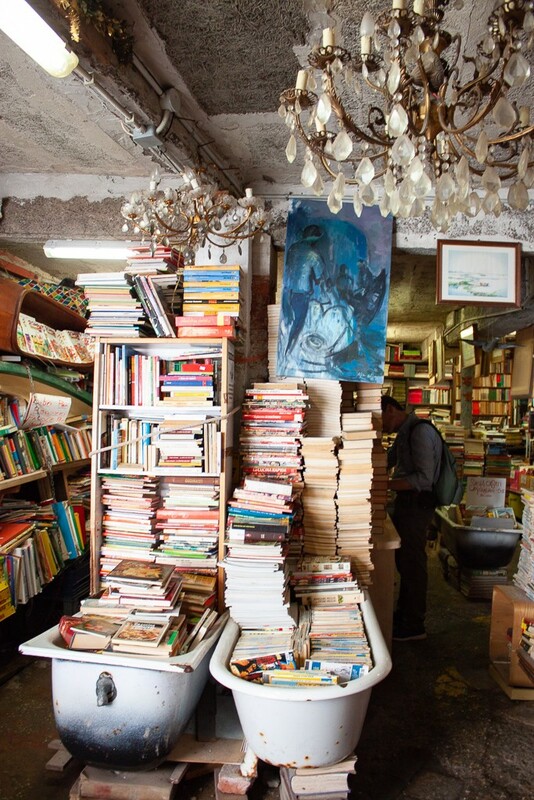 Although tiny, the shop is full of weird and offbeat delight starting with it being packed floor-to-ceiling with books, magazines, maps, and postcards in various languages. 60% of the books are new with finds ranging from comic books, best sellers, cook books, travelogues about Venice, and more. The interior design is one heady experience, with several beaded chandeliers, mannequins dressed like old Venetians, and oars hanging from the wall. Adding to the charm are the resident cats who you’ll find here and there having a lazy afternoon snooze on top of a pile of books. 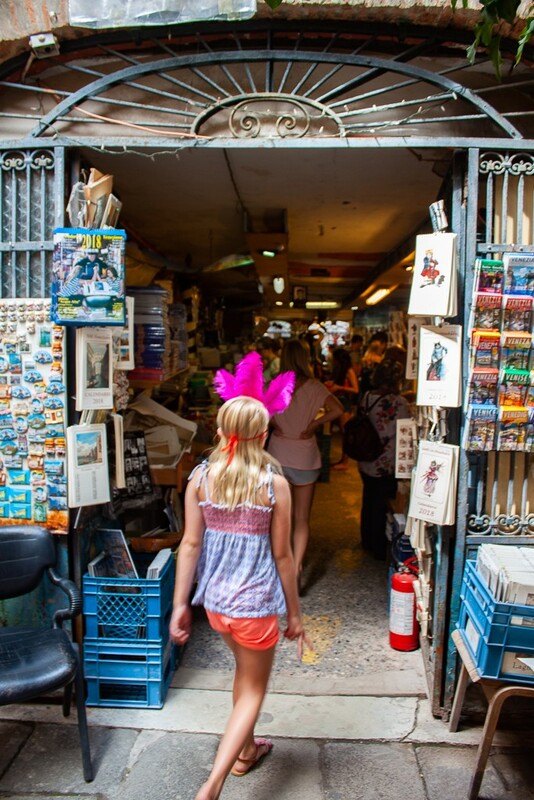 The shop’s various nooks and crannies appeal to the Instagrammers in all of us, like the “fire escape” which is really a door leading directly out to a canal and the courtyard turned art project where you can literally walk up a flight of colourful old encyclopedias and get yet another peak of the neighbouring canal. 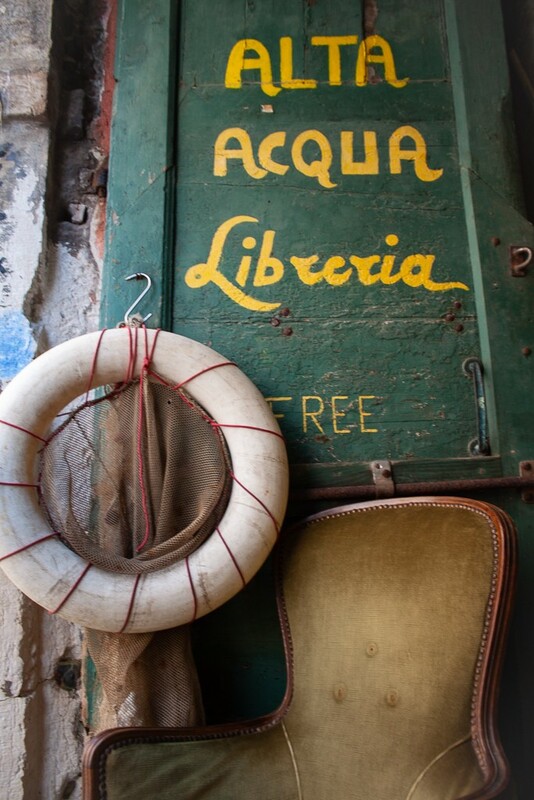 1) Libreria Acqua Alta is open daily from 9:00 am – 8:00 pm. 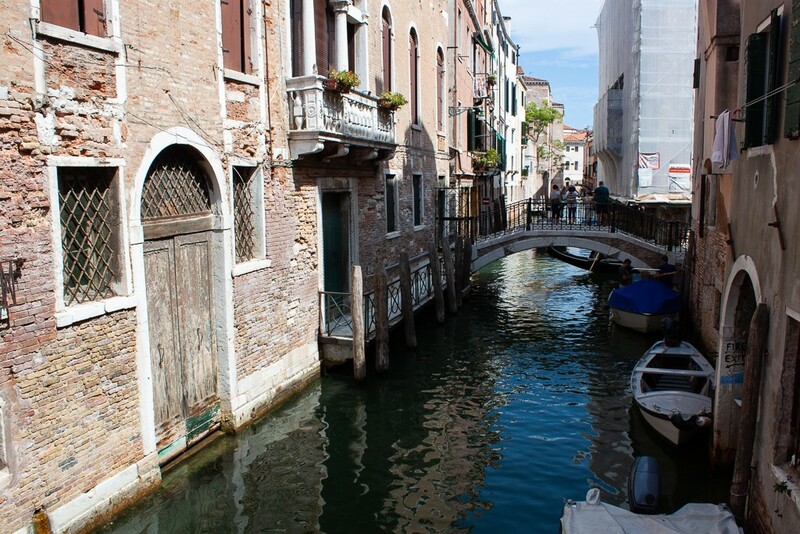 2) To avoid massive crowds which is next to impossible in Venice, show up early or late in the day. 3) Despite the massive amount of visitors this place attracts, the bookstore is struggling to remain open. 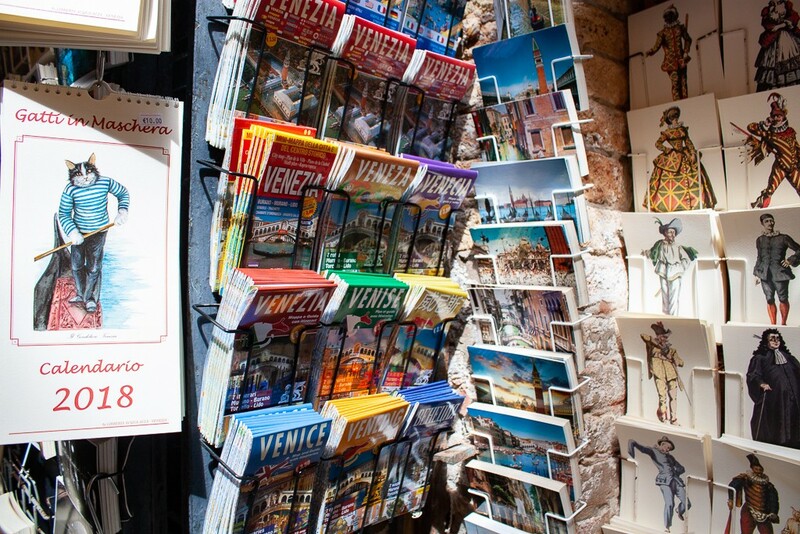 When there, do your part and buy something to help keep this unique cultural institution in Venice afloat. 4) While many of the books are in Italian, there’s a fair number of titles in English and other languages. Books are a mixture of new and used. 5) If you like all things weird and offbeat, check out some of my personal favourites like this one about river surfing in Munich, the scary skull cathedral in Otranto, or this one about the pharmacy museum in Krakow. Or read these posts from other travel bloggers – like this one about how to spend 3 days in Rome or this one, 62 Best Cities, Towns and Places to See in Italy. 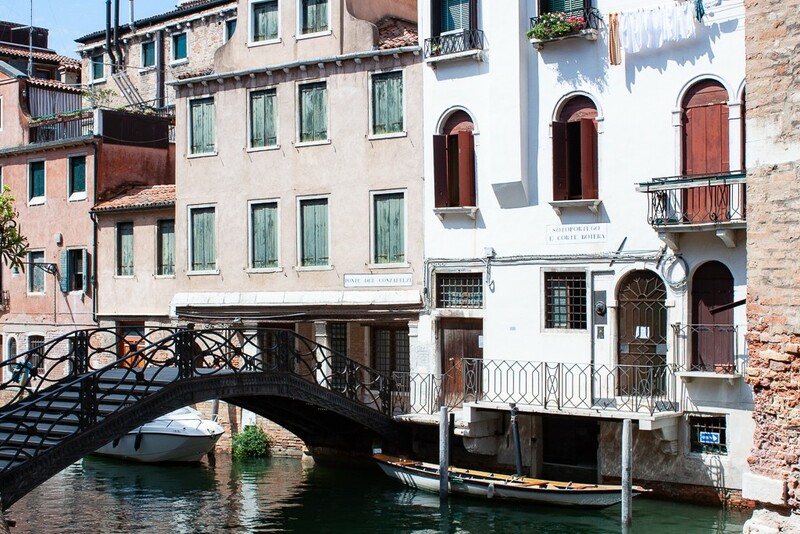 Need somewhere to stay in Venice? Check out hotel offerings on booking.com. Weird and Offbeat Sites: An Insiders Look At The Lloyd Hotel. 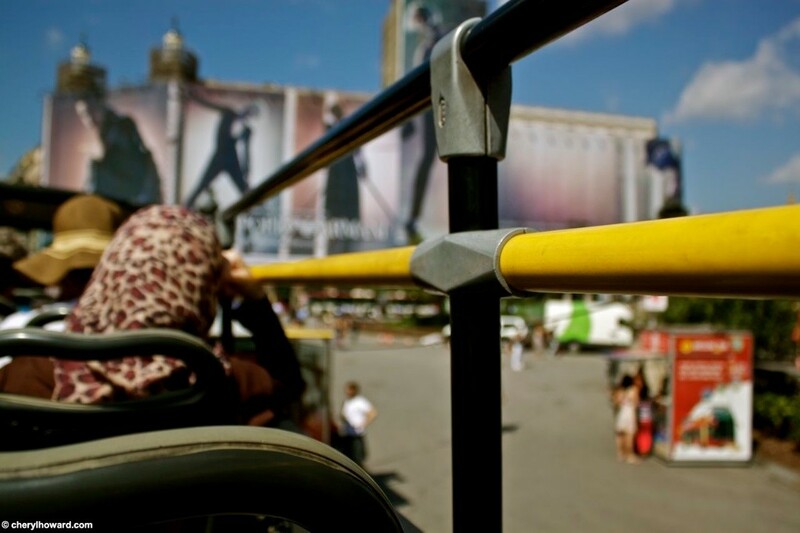 Glimpsing Everyday Life in Barcelona. Wow! Wonderful post and article you shared. You capture awesome pictures in your post!! What a beautiful bookstore this. Thank you so much Jam! I think it’s a beautiful bookstore too.